Diesel Tech Industries has the only positive air shutoff system available with comprehensive event logging build in. 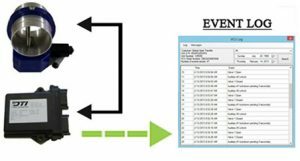 Our event logging tracks all events such as maintenance cycling, emergency shutdown, updating and more. Accompanying each log is a timestamp to verify the time and date of the event, as well as other data such as speed, RPM, battery voltage, and temperature, providing as many details as possible. Unlike our competitor’s passive systems, DTI is always working, and safeguarding. Real-time event logs that provide a detailed report of all ongoing activity of the Guardian system, including emergency shutdowns, daily maintenance cycling, manual shutdowns, and more. Maintains records of overall run-times for both vehicle engines, and PTO systems. Logs can be accessed by connecting to the Valve Control Unit (VCU) to a compatible device with our software. Compatible devices include all windows-based computers, and most Android systems.